Fits ANY minivan. Compact size fits just about anywhere. 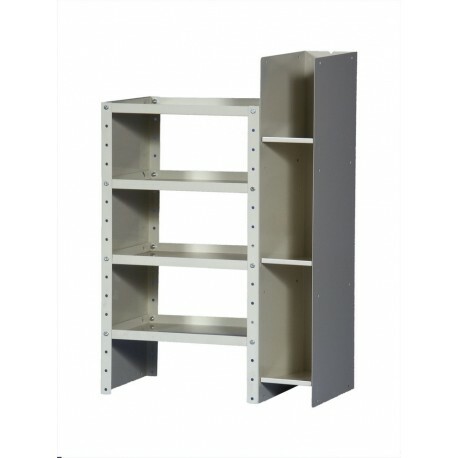 Four shelf Storage Rack has shelves adjustable on 2" centers. Fits ANY minivan. Compact size fits just about anywhere. Four shelf Storage Rack has shelves adjustable on 2" centers. Shelves measure 18" x 12". The Catalog File is great for keeping your books, binders and papers secure and in order. Finished in off-white powder coating to reflect more light in your van and to provide years of durable service. Comes complete with all assembly and installation hardware and brackets.We recommend measuring your truck to ensure a proper fit.